GUARDIAN MUST READ BOOKS OF 2019 'The you-gotta-read-this anthology' Stylist'This collection showcases the joy, empathy and fierceness needed to adopt the country as one's own' Publishers Weekly An urgent collection of essays by first- and second-generation immigrants, exploring what it's like to be othered in an increasingly divided America. From Trump's proposed border wall and travel ban to the marching of White Supremacists in Charlottesville, America is consumed by tensions over immigration and the question of which bodies are welcome. In this much-anticipated follow-up to the bestselling UK edition, hailed by Zadie Smith as 'lively and vital', editors Nikesh Shukla and Chimene Suleyman hand the microphone to an incredible range of writers whose humanity and right to be in the US is under attack. Chigozie Obioma unpacks an Igbo proverb that helped him navigate his journey to America from Nigeria. Jenny Zhang analyzes cultural appropriation in nineties fashion, recalling her own pain and confusion as a teenager trying to fit in. These writers, and the many others in this singular collection, share powerful personal stories of living between cultures and languages while struggling to figure out who they are and where they belong. 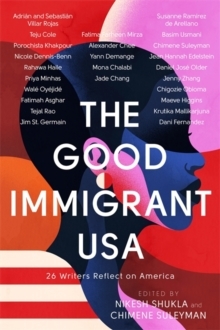 By turns heartbreaking and hilarious, troubling and uplifting, the essays in The Good Immigrant USA come together to create a provocative, conversation-sparking, multi-vocal portrait of America now. Essays from:Porochista Khakpour; Nicole Dennis-Benn; Rahawa Haile; Teju Cole; Priya Minhas; Wale Oyejide; Fatimah Asghar; Tejal Rao; Maeve Higgins; Krutika Mallikarjuna; Jim St.